When playing a game of Gwent against other players, it can be fun and entertaining to use emotes. They provide a great way of expressing annoyance, taunting or misleading the opponent into making a bad move. Follow this quick guide and we’ll show you where to find the emote button and talk you through what you can do with them. Plus, you can find more guides and updates right here at Pwrdown! 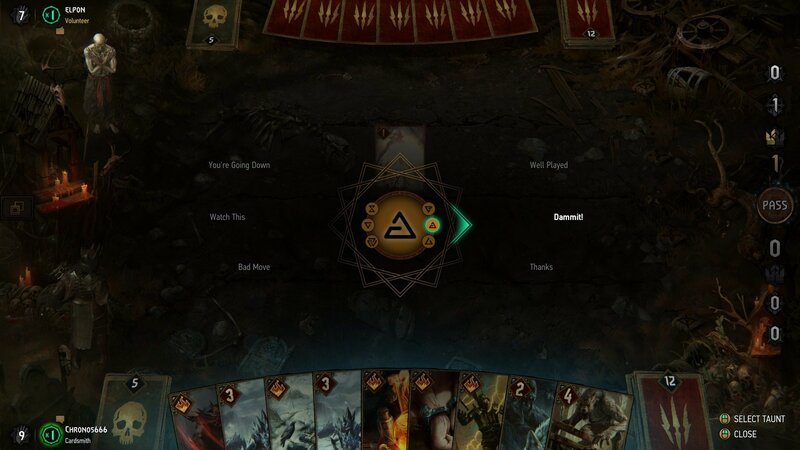 The emote button in gwent can be quite difficult to find. It’s hidden away in the left-hand corner of the screen, just above your name. Click on the speech mark icon and you’ll be taken to the emote screen. You’re going down – A great taunt to strike fear into your opponents heart. Watch this – About to pull off a wicked combo? Use this emote first! Bad Move – Use this emote to call your opponent out on a bad mistake. Well Played – Show good manners and use this emote at the end of a game. Dammit! – Use this emote to show you made a misplay or trick your opponent. Thanks – Use this emote to thank your opponent. These six emotes cover almost any interaction and you can use them in a variety of ways. However, avoid spamming them where you can. It’s bad showmanship and you might not get your end of game GG.